Every year during summer, I spend 4-6 weeks in Rio de Janeiro, Brazil. I am a high school librarian, so I have the time, and my family lives in Rio, so I have a reason. Once I started sewing consistently, I realized that I could not stay away from sewing for such a long stretch, so I bought a sewing machine for my vacation situation. What I failed to take into account was that a sewing machine is not much help without the essential tools every sewist should have. Even though I had a machine, I had to wait until the following summer to start sewing because I did not have my tool kit with me. A good pair of scissors is a must-have. Back home, I bought a cheepo pair of scissors at the papelaria (think a neighborhood version of Office Depot) around the corner, and well, you can imagine how colorful my language got every time I tried to cut into fabric. 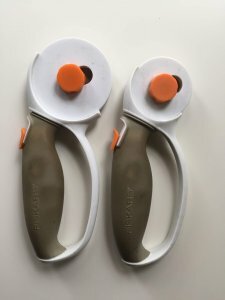 I have a pair of Fiskars shears that only I am allowed to use. 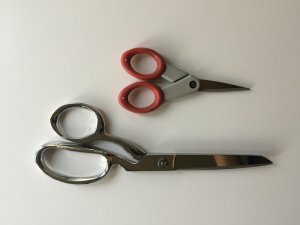 I Never, EVER use my expensive fabric scissors to cut paper or thread. I should sharpen my scissors often, but I say with some shame, I have never done it. I have tried the aluminum paper trick, and it works well. • Pinking shears provide a quick and easy way to finish raw edges. They also help when grading seams. • Embroidery scissors are small, so they are great when I have to clip very close to a seam. • Duck bill scissors help with grading seams as they prevent cutting into another layer of fabric accidentally. • Thread snipper or scissors dedicated to cutting thread—because I NEVER EVER use my fabric scissors to cut thread. 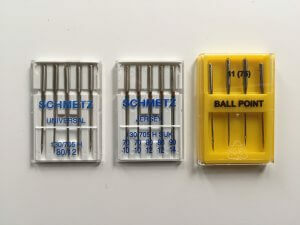 Needles are cheap, so I buy a whole bunch and change my machine needles often. I heard that needles should be changed every eight hours; I am not that disciplined, though. Not all needles are the same, so I make sure to check the correct needle for the fabric I am using (jersey needles for knit fabrics, for example). 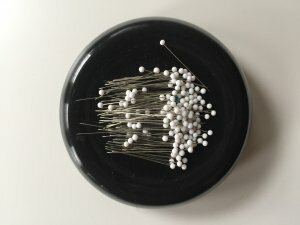 I also have a set of hand sewing needles because, as much as I avoid hand sewing, I find myself reaching for a hand sewing needle every once in a while. 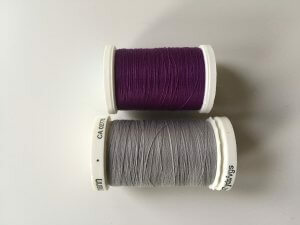 I buy good quality thread. Thread is not expensive, and there is nothing worse than running out of thread halfway through a project. I always buy more than what I need for a project. Since a lot of what I sew is gray or black, I have a lot of gray and black spools around. TIP: Pale gray is considered a neutral color, so if you are working with fabrics of different colors or busy prints, reach for gray. I learned this from the phenomenal Gretchen Hirsch. 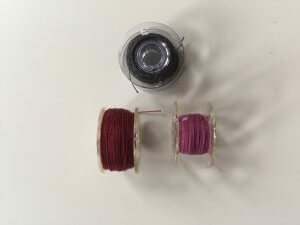 I just hate when I have to start a new project, and I cannot find an empty bobbin for the thread I am using. When I buy extra bobbins, I check the manual for what kind of bobbin my machine uses—because I always forget, and there is no way I am buying the wrong kind and hurting my machine. I spend a lot more time unpicking seams than I do sewing them. The is one universal truth about sewing, and that is: Things will go wrong. But as long as I have my seam ripper, I will be okay. When I use my seam ripper, I am very cautious: it is not uncommon for it to rip more than the stitches. I have ruined garments because I grow impatient and try to speed up the process. With the seam ripper, it is always slow and steady wins the race. I love transparent rulers. They make marking seam allowances and hems so much easier. 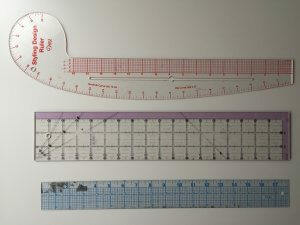 The Dritz 18-inch sew-though ruler is affordable and very useful. 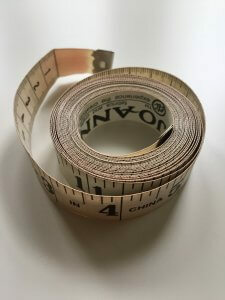 Because I use rotator cutters, I have a sturdier ruler to help with cutting fabric. It is also useful when I need a longer or wider ruler. Because I often have to make adjustments to patterns, I have a French curve that makes drawing much easier. 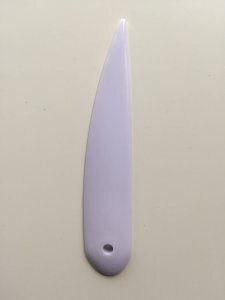 This little tool is a lifesaver when I am hemming skirts or checking the distance from my needle to my seam. Because it is small, it tends to disappear (usually, when I need it the most), so I have a couple of them around. 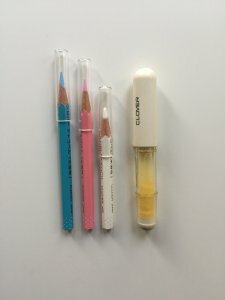 Clover pencils are my favorite marking tool. They are so creamy and delicious, and they are water soluble. When I need to transfer darts or seam allowances, I use Saral wax-free transfer paper. It can get a little messy as it is almost powdery, but I’d rather save time and frustration and deal with the mess than use other methods. Also on the powdery side, Clover chalk pens are great to mark darts, but beware: I have read reviews complaining that the chalk leaves stains on some fabrics. TIP: Always test on a small scrap to see how a fabric will react to a marking tool. I use silk pins with glass heads. They are more expensive, but they are sharp as hell and can take the heat of an iron. Having pins means I must have somewhere to keep them so they don’t get lost. After finding pins all over the house (and sitting on some too), I purchased a magnetic pin dish. I also have a pincushion where I keep the pins I do not use often. In order to get crisp seams, a sewist MUST use an iron. 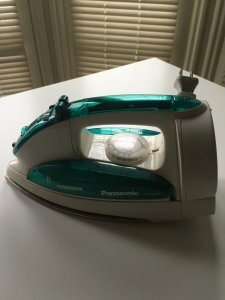 My iron is meh, so I know that no one needs to spend a lot of money on a fancy, state-of-the-art iron to get beautifully pressed seams. I always make sure that my iron is clean. When it gets dirty, I clean it with baking soda and water (I found this method here). 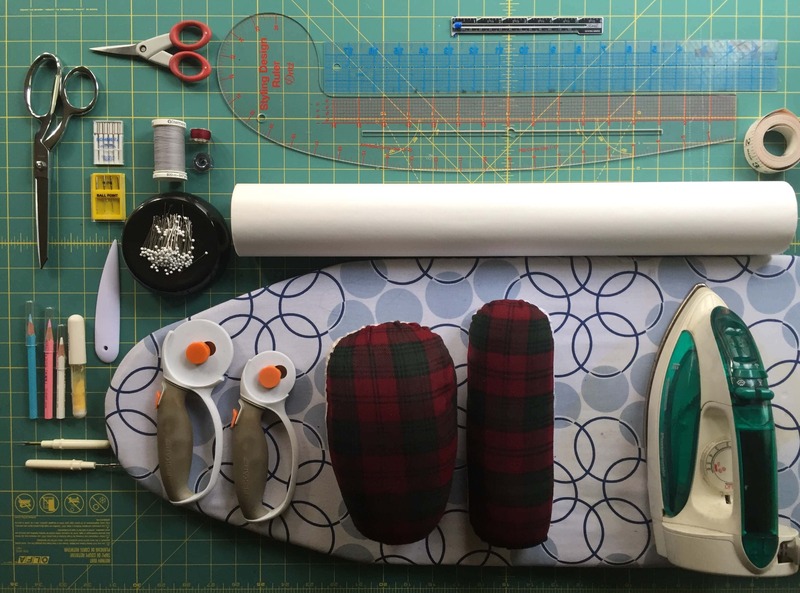 Because I have a small sewing space, I have a small ironing board that I place on my cutting board. The board is also meh, and I guess I could use some more padding to it, but it does the job. When ironing darts, curves, or sleeves, these tools with appetizing names make all the difference. The ham helps shape and preserve curved seams; the sausage takes away the frustration of pressing those hard-to-get sleeve seams. 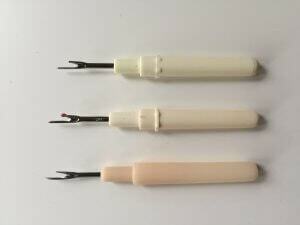 I cannot imagine pressing darts or sleeve seams without them. I trace all of my patterns (#teamtrace), and I have flirted with pattern making, so pattern paper is essential. I used Swedish paper before, but it is kinda expensive. 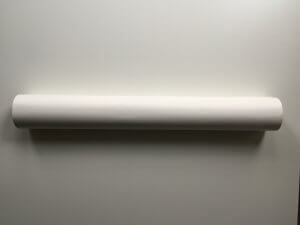 Now I use medical paper, the type that doctors use to cover the exam table. It is very affordable, and it lasts forever. You know when you sew a seam that ends in a point, and you cannot make the point pointy? The point turner does exactly what the name says: it makes those points nice and…pointy! But beware: be gentle and go slow. You do not want your turner to rip through the fabric. These days, I use my rotary cutters to cut fabric. They are particularly great when cutting slippery or stretchy fabrics. They are extremely dangerous, though. You can easily cut yourself if you are not paying attention. These things are sharp! Rotary cutters require a cutting mat. I have a self-healing one placed on top of my cutting table. The first one I had warped to the point of becoming unusable, but it was my fault. I would place my ironing board on top of the mat, and the heat warped it. Now, I keep my iron (and any source of heat) away from it. TIP: To keep the fabric from shifting, I use washers that I bought at my local hardware store. 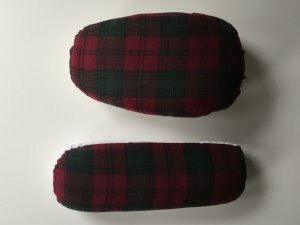 They are cheap, come in a variety of sizes, and work really well. You can even paint them! Do you need all these tools to start sewing? Probably not, but they really help. I didn’t buy everything all at once, though. My toolkit has expanded in response to my sewing needs. And I could probably do without some of these tools with a little creativity (I’ve seen sewists use chopsticks in place of a point turner, for example). It is nice, however, to have the right tool for the job handy. I have a small box that meant to be a tool box; I’ve used for the last nine years. One of my favourite tools is my tracing wheel for copying patterns, and washy tape for more accurate seams. My Ikea fabric scissors, and my favourite threads are Moon threads comprise of 50% polyester and cotton. Overall, I would agree with your favourites being vital for any seamstress. I also love my tracing wheel—-so useful when tracing darts or seam allowances! I don’t know Moon thread. I will look it up. It’s always great to compare techniques and items with others. You sum up the important information and I use almost the same. 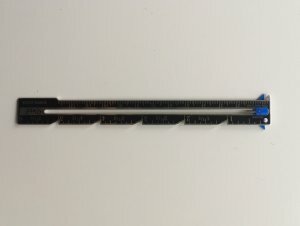 I’m not sure if I would need a sewing gauge – have to take a closer look at that. I know I definitely need tailor’s ham & sausage, I don’t know why I always forget to buy or make them… I wouldn’t buy a point turner, as I’ve only seen unreasonably expensive ones and using other items, mostly pens, works fine for me so far. I love my tailor’s ham and sausage. Pressing sleeve seams was really frustrating; the sausage makes it so much easier.